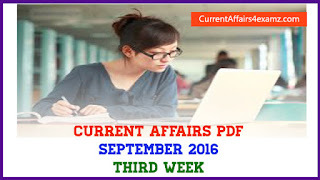 Hi Aspirants, here is the Current Affairs Quiz covering the important happenings of 14 August 2016 useful for all upcoming exams. 1. Union Government has launched the first phase of Smart Ganga City programme in 10 cities located along River Ganga on 14 August 2016. Name the Union Water Resources Minister? 2. Name India’s top squash player who recently won the prestigious PSA Australian Open held in Melbourne? 3. Na Muthukumar who died on 14 August 2016 was a famous? 4. Name the Bollywood actors who bagged the best actress & best actor awards at the Indian Film Festival of Melbourne 2016? 5. Who recently became India's first captain to win two Tests in West Indies? 6. South Indian Bank (SIB) & ____ has recently announced their collaboration to launch co-branded credit cards for the customers of South Indian Bank? 7. India will be celebrating its ___th Independence Day on 15 August 2016? 8. According to a recent research by NASA which planet was habitable for up to 2 billion years? 9. Name the world No. 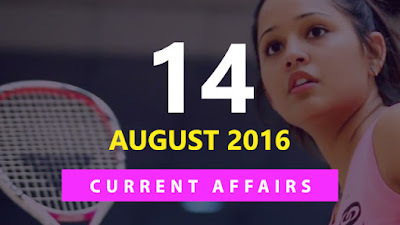 61 women badminton player who defeated Saina Nehwal in the group stage of Olympics 2016? 10. What was the theme of 2016 International Youth Day (IYD) observed on 12 August?